Don’t look any further, you’ve located a great place to host your Kids Party in the Baltimore area! 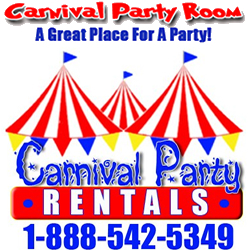 The Carnival Party Room is the ideal location to serve a great themed Children’s Party of your choice. Select from a variety of party packages and you will be sure to find the appropriate theme celebration for anyone from 1-12 years old. Be the Guest at your own Kids Party! The Birthday Director will help you plan your event party and everything will be ready for you to simply enjoy your child’s big day.